Good morning! So it's probably a surprise to you, but I finished that bag yesterday! It went together better than any of these bags I have made in the past, like I said, the buckram and the fusible fleece were so cooperative. I almost wanted to dig in and make myself a new bag, but then I figured why jump into anything. Plenty of time. Fusible fleece though, I jinxed myself a little talking about it in yesterday's post, today when I was pressing the lining after I turned it and stuffed it into the bag and I noticed that orange peel look on the front. NOT COOL. Fortunately I was able to press it out.. but after that I was pretty careful. 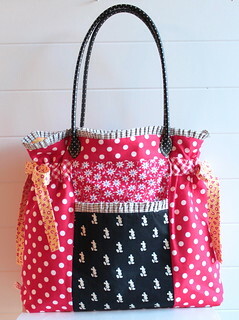 What a beautiful bag - love the style of it and how you put all the fabric prints and colors together! I love that bag, it turned out great and I love the fabric choices you used. Absolutely adorable! Your stylist will love it. A very Merry Christmas to you and yours! Your bag is so cute. I made a bag that had that orange peel to it, I didn't know it could be ironed out. I just finished a Amy Butler bag.. Here in southern Colorado we like a white Christmas, but there is no snow to be found here in "town"... Merry Christmas! Adorable! I'm sure your hairdresser loved it! So cute! Pam. Merry Christmas to you and yours Pam! DARLING...and the purse pattern used is what? Merry Christmas PK Morning! OhMyGosh PKM -- that bag is adorable!!! I was going to give you a hard time 'cause I hadn't seen it on Insta, but I do the same thing -- we have to have a few surprises for our blogs! LOVE LOVE that blog!! !